Back by Popular Demand, and IMPROVED!! Measure and cut in one easy step! Ruler features Two-toned Grid Print numbers and grids are outlined with white so it's easier for consumers to read numbers on both light and dark fabric. 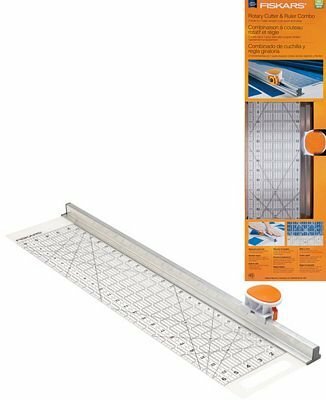 Grids are printed both ways, (1-6" and 6"-1") for left or right handed users. Features a carrying handle in the "dead zone". The blade carriage has been enhanced to require less force during cutting and to fit better in the hand. Easy blade change! A no-touch blade change and disposal system in a convenient 5 pack (see item # 195120-1001 or item # 197890) unit comes with one 45mm blade installed.